The following is related to, or excerpted from, "Mutating Media:Transmission of the Ring Virus," the second chapter of my book manuscript, Media Epidemics: Viral Structures in Literature and New Media. None of the information on any of the pages contained herein may be reproduced in any fashion without my express written consent. I encourage visitors to interact with the Transmission Timeline for themselves. Portions of the timeline relevant to the first section of my manuscript chapter are pictured below. In 1991 Kadokawa Shoten published the novel Ring (English title: Ring) by Koji Suzuki. In epidemiological terms, this novel was “Text 0,” the index case from which an entire media phenomenon spread. This chapter begins by tracing the outlines of transmission of the Ring virus, beginning with Ring, and finishing with the 2011 projected release of The Ring Three. The second half of the chapter includes analysis of the texts themselves to examine standard objects and compulsory transmission. Situated within a media ecology of technological and social vectors, the standard objects of the Ring universe, including the texts themselves, exceed their standard definitions. This excess is exemplified in unexpected behaviors that affect systems of transmission and impose compulsory constraints. In transmission on the global scale, the unexpected popularity of Ringu as well as its source texts and subsequent sequels results in an infectious new genre and new systems of adaptation and translation in which an assemblage of horror production and distribution is formed between U.S. and Japanese studio systems. After the release of Suzuki's novel Ring in 1991, the franchise underwent many generic mutations. Ring was only a moderate publishing success (Meikle 91), yet the reiteration of the plot into multiple media forms increased the infectiousness of the story. For instance, in 1995, four years after Ring's publication, the original text was mutated into a made-for-television movie, Ringu: Kanzenban. The release of the television movie was timed to coincide with the release of Suzuki's second novel in the franchise, Rasen, (English title: Spiral). These were followed by the serialization of Ring as a manga, which was then collected into one volume in 1996. As Dennis Meikle notes, after the release of Ringu: Kanzenban to video, “that, in truth, should have been that. But something about Ring resonated deeper within the Japanese psyche than tales of apparitions in schoolhouses...so the reassertive figure of Sadako inexorably began to take hold in the minds of those who had read the novel, or seen the TV movie, or both” (91). Thus far limited to isolated outbreaks, the franchise was about to become an epidemic. January 31, 1998, saw the simultaneous release of the third novel, Rupu (English Title: Loop) and the feature film versions of Ringu and Rasen. While Rasen was a relative failure (Meikle 123), Ringu quickly became an epidemic. Not only did the movie itself enjoy great success, but it also tripled sales of Suzuki's novel from 500,000 to 1.5 million copies (Meikle 124). The feature film Ringu was followed by more television movies (two), manga (seven), feature films (four), video games (two), and a book of short stories. The morphing of the plot into so many different genres reinforces the characterization of the franchise as “viral.” The plot is replicated into multiple media forms in order to increase its infectiousness—viewers of the film seek out the novel, readers of the novel pick up the manga, and so on. Aside from the infectious nature of reiterating the story in different media forms, the franchise also benefited from several urban myths. Many urban legends circulated around the Ringu films, from ghostly apparitions visible in the film to speculation that Sadako Yamamura (played in the film by Rie Inou) was involved in an apartment fire that destroyed one of the films' sets (theringworld.com). These myths, circulated on the Internet and taken up by media outlets such as the Japanese television show Unbelievable, increased the infectiousness of Ring's transmission by creating “hype” around the franchise. According to Matthew Fuller, “hype is that moment when the transmission of information in the strict sense reflexively incorporates information about the fact of its transmission as part of that transmission. It is not simply information, but the way in which it moves” (36-37). The plot of Ring is self-reflexive in that media transmits the virus within a plot which is itself transmitted through various media forms. Additionally, stories of real-life hauntings recursively enact the plot of the film, performing a refusal of entropy that is characteristic of hype (Fuller 36). In this way information is circulated not just in authorized media outlets but also amongst people and along the margins. For the most part, the initial Ring virus outbreak was contained in Japan, with the production of the various adaptations originating from the desire to capitalize on the film's domestic popularity. Suzuki's production of texts ceased on February 5, 1999, with the publication of Baasudei (English title: Birthday), a book of short stories that fill in the storylines of the three novels. The Japanese production of origin texts culminated in the release of Ring: Terror’s Realm, a video game for the Sega Dreamcast in February 2000. It was not until after the end of the production of Japanese source texts that the hype began to circulate extensively on the international market. Sometime in 1998, the film Ringu was released in Brazil. Although the exact release date is unknown, this first international release is notable as the beginning of the worldwide media epidemic. In epidemiological terms, the film becomes a superspreader. It introduces the media virus and is the beginning of several international outbreaks. However, in contrast to a biological virus, which generally exhibits a pattern of transmission once cases and carriers are mapped, the Ring media virus exhibits no consistent pattern of release. For instance, the 1998 Brazil release of the film was direct to video. In contrast, in Spain, Ringu and Ringu 2 were released within a few days of each other at the Sitges film festival. Ringu then went into general release a year later, followed by the release of the American adaptation and then a translation of the novel. 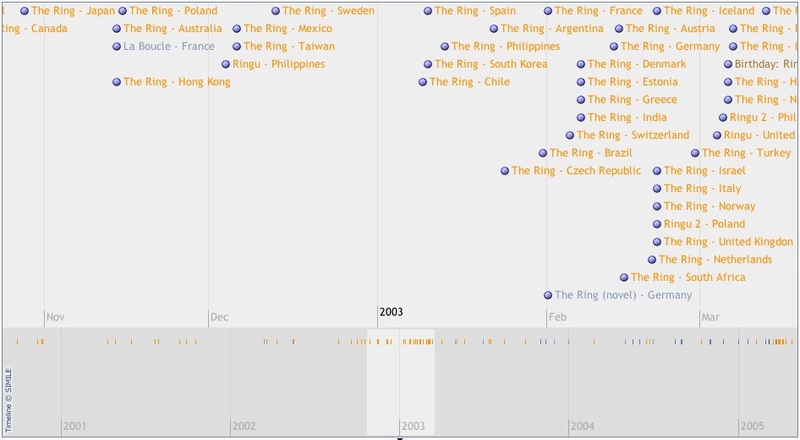 One final example shows the variety of release patterns: in France, Ringu and the Korean adaptation, The Ring Virus, were released simultaneously in April 2001. Then, the translation of Suzuki's novel was released the same week as the film release of Ringu 2. Additional print translations preceded the release of the American adaptations, which were then followed by releases of the manga. In direct contrast to Suzuki's assertion that “Japanese literature does not have a global appeal nor does it meet global standards” (Kalat 24), the Ring media virus was becoming an international epidemic. This lack of a consistent release pattern suggests that the film was circulating in an “unauthorized” manner, consistent with a viral structure. The lack of a foreign distribution strategy on the part of Kadokawa Shoten, the publishers of Suzuki's novel and the production company of the films, is a reminder that the J-horror media ecology does not typically include international release (Kalat 174). Thus, the film gained an international cult audience in a media ecology that was not constructed to facilitate such a thing. If one looks at the general pattern of all releases of the Japanese origin texts, one sees a slow seep as the texts move around the globe (See Figures 1 and 2). Rather than a long-term international marketing strategy, it is possible to read the slow circulation with no discernible pattern as a narrative of word-of-mouth communication, spreading across a decentralized network of horror film subcultures and communities of Japanese culture enthusiasts. The film’s transmission does not originate from one centralized node, nor does it attain the visibility of a highly-funded marketing blitz. This narrative operates on a smaller scale and clashes with the typical capitalist circulation of the U.S. studios within a media ecology that involves copyright, widespread release dates, etc. The film is unauthorized, and to some extent, self-replicating because it is not circulating within the established ecology of the U.S. studio system's international distribution model. In addition to its unauthorized infectiousness via international release, the Ring virus is also spread through adaptation into cultural remakes. The earliest among these is the aforementioned South Korean film The Ring Virus, released in 1999. This film follows Suzuki's novel more closely than the Japanese film Ringu. Although it is touted as the Korean version of the Japanese film (DVD case), it would more accurately be described as a hybrid of Suzuki's novel and Hideo Nakata's film. However, the American film adaptation, The Ring, which premiered at the Hollywood Film Festival on October 2, 2002, is a clear remake of the Japanese film—the story line is almost exactly the same and many of the iconic Japanese visuals are reinterpreted in Gore Verbinski's film. The Ring Virus adaptation had a very limited global transmission. According to my current data set, there were only two other releases—at a film festival in France and on DVD in the U.S. In contrast, the American adaptation was widely released. In fact it is at this moment on the timeline, in October 2002, that the pattern of transmission shifts radically (See Figure 3). I would argue that at this point the viral-nature of the franchise is destabilized. The American film spreads via a more aggressive, temporally compressed pattern, originating from one central node. Although this looks like the moment that the virus goes pandemic, the central point of transmission is problematic. It is no longer a true viral structure because it is no longer unauthorized, nor sub-microscopic. Certainly this pattern of visibility achieves the aims of the U.S. studio system, however, it loses the sub-cultural authenticity of the true viral structure. 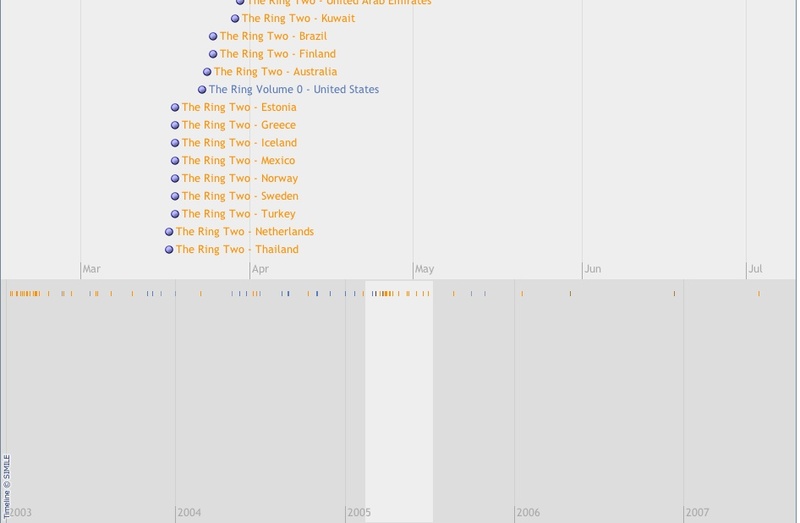 Once the next American film, The Ring Two, is released on March 18, 2005, we see another destabilization of the viral—this one even more assertive and temporally compressed (See Figure 4). 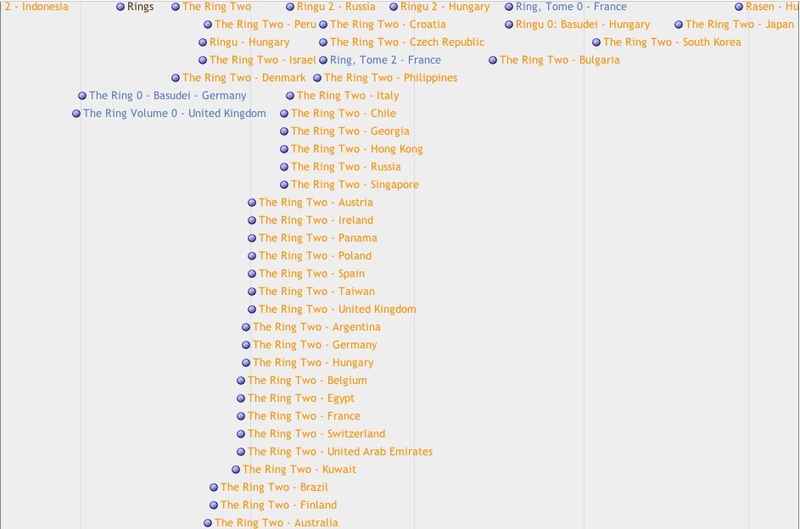 The pattern of release dates of both The Ring and its sequel, The Ring Two, suggests that international releases were contracted in advance, well before the films were able to gather the hype of their Japanese counterpart Ringu. Unlike Kadokawa Shoten's strategy with Ringu, it is clear that DreamWorks had a rigorous international distribution strategy in place before the films were released. Every showing was contracted in advance and presumably supported by a robust marketing campaign, thus circulating in a highly visible and standardized manner. No need to pass along a grainy video copy to spook your friends; you can all go see it together at your local multiplex. No travelling to theaters that show indie and international releases; this film is likely available in your own backyard. Rather than operating invisibly, DreamWorks operated instead according to a logic of hyper-visibility. With the release patterns of Ringu we see a haphazard pattern of visibility that emerges and dissipates without any discernible logic. In contrast, The Ring is exceedingly visible on the international stage all in a short frame of time, like some sort of super outbreak. And yet, the distributors attempt to replicate the viral hype of Ringu. Casting The Ring as “viral” requires an elaborate masking to disguise its aggressive release pattern. For instance, for The Ring, the filmmakers created a website to document the restoration of the lighthouse on the fictional Moesko Island off the coast of Washington state (IMDb.com)*. Part of the marketing campaign for The Ring Two involved distributing VHS tapes that contained recorded images from the cursed video, followed by the web address www.she-is-here.com, a viral marketing site containing the stories of “survivors,” similar to the forums in the short film Rings. Additional fake websites were created for The Ring Two for entities such as the real estate agent selling the childhood home of Samara. DreamWorks used viral marketing strategies to try to recapture the original viral hype of Ringu. Although the strategy was successful, the unmasking was potentially harmful to the company's reputation. Users of the role-playing site at she-is-here.com were upset when they learned that DreamWorks employed the site’s administrator, Erika. By appropriating the subculture's strategies of fandom, DreamWorks was able to increase the visibility of the film all the while pretending to operate along the margins. The success of this strategy is indicated by the fact that the site is once again operational. Users of the role-playing forums expressed initial trepidation about the site’s return and the potential that they were once again being “used” by DreamWorks, but have since embraced its presence as a way to increase the visibility of the forums. After the initial onslaught of the American film releases, the pattern of transmission returns to the more viral-like dissemination that occurred pre-American release (See Figure 5). The hyper-visibility of the U.S. studio system's international release strategy is short-lived though financially lucrative. Of course, the entire history of the Ring media virus is inflected by economic concerns, but there is a distinct difference in the strategies of dissemination between the Japanese and American studio systems, suggesting fundamental differences between various scalar strategies of the viral. The Japanese studio system had unexpected international success because of Ringu's viral transmission into the global market. In contrast, the U.S. studio system operates under the logic of an always-exportable cultural product, supported by a hyper-visible marketing strategy that attempts to mimic the viral. Different though the various strategies may be, one can also make a case for the infectious nature of the U.S. studio system's model of international distribution. According to David Kalat, one of the aftereffects of The Ring's success has been that “Americans started financing the production of Japanese horror films, while Japanese filmmakers started making J-Horrors directly within Hollywood, intermingling the Japanese and American film industries in unprecedented ways” (240). The imperative to make a profit results in compulsory changes in international film production strategy and the transmission of texts across national boundaries, as the goals of the two studio systems come into alignment, forming an international network**. However the network is unevenly formulated as the importing of Japanese horror films into U.S. culture almost always requires the reframing of the text through adaptation – Japanese plots are re-filmed in English, often with Japanese directors at the helm, all the while wearing the mask of American culture. The profit imperative of international capitalism allows the Ring virus to infect, albeit unevenly, both the U.S. and Japanese studio systems. Thus the viral is visible at different scales—in the transmission of individual texts and in the way that the imperative to profit infects the institutions of textual production. The infectiousness of the genre and its lucrative returns results in an assemblage of U.S. / Japanese production that redefines the territory of both film markets. *Previously available at http://moeskoislandlighthouse.com, the site is now only available on a mirror site at http://www.sweb.cz/moesko/. **Here I draw upon Manuel Castells in Rise of the Network Society for the concept of the “international network.” Castells argues that truly multi-national corporations are a fiction because corporations are always grounded in a nation of origin in a way that does not erase “national boundaries, identities, and interests” (192). He conceptualizes these organizations as instead achieving international networks. Castells, Manuel. The Rise of the Network Society. Malden: Blackwell, 1996. Eckmann, Sabine. “Seeing and Performing.” Window / Interface. Sabine Eckmann, Lutz Koepnick, eds. St. Louis: Mildred Lane Kemper Art Museum, 2007. Eisenstein, Sergei. “The Montage of Film Attractions (1924).” The Eisenstein Reader. Trans. Richard Taylor and William Powell. London: British Film Institute, 1998. Eisenstein, Sergei. “The Dramatugy of Film Form (The Dialectical Approach to Film Form) (1929).” The Eisenstein Reader. Trans. Richard Taylor and William Powell. London: British Film Institute, 1998. Engels, Jonathan. The Epidemic: A Global History of AIDS. New York: Smithsonian Books, 2006. Hall, Stuart. “Encoding, Decoding.” The Cultural Studies Reader. Ed. Simon During. New York: Routledge, 1991. 507 – 17. Kalat, David. J-Horror: The Definitive Guide to The Ring, The Grudge and Beyond. New York: Vertical Inc., 2007. Koepnick, Lutz. “The Aesthetics of the Interface.” Window / Interface. Sabine Eckmann, Lutz Koepnick, eds. St. Louis: Mildred Lane Kemper Art Museum, 2007. Meikle, Dennis. The Ring Companion. London: Titan Books, 2005. Mitry, Jean. Semiotics and the Analysis of Film. Trans. Christopher King. Bloomington: Indiana UP, 2000. Reisberg, Paul. HIV, Part 1. <http://www.wellesley.edu/Chemistry/Chem101/hiv/HIV-1.html> 11 Mar. 2008. TheRingWorld.com. <http://theringworld.com> 11 Mar. 2008. Until There’s a Cure. <http://utac.org> 10 Mar. 2009. Venuti, Lawrence. “Introduction.” Rethinking Translation: Discourse, Subjectivity, Ideology. Ed. Lawrence L. Venuti. New York: Routledge, 1992. White, Eric. “Case Study: Nakata Hideo's Ringu and Ringu 2.” Japanese Horror Cinema. Ed. Jay McRoy. Edingburgh: Edinburgh UP, 2005.